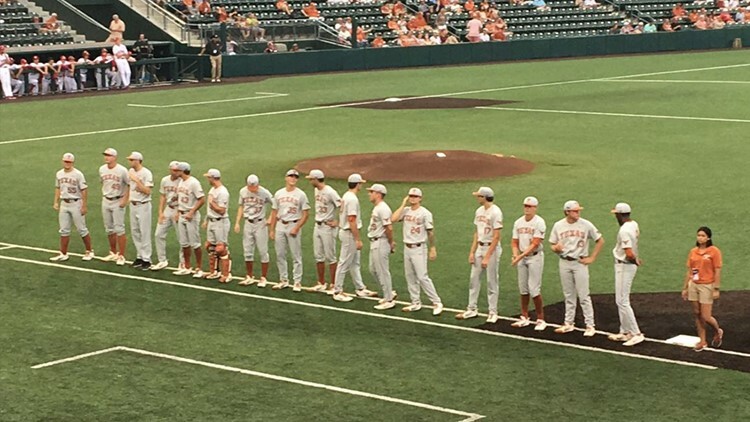 The Longhorns will now head to the Super Regionals. Their opponent will be confirmed Monday. AUSTIN -- Sunday night the Texas Longhorns clinched the NCAA Austin Regional defeating Indiana, 3-2, to advance to the super regionals. Blair Henley got the start for the Longhorns while the Hoosiers sent Andrew Saalfrank to the mound. Texas scored the first run of the game in the second inning when DJ Petrinsky grounded into a double play with zero outs. That allowed Masen Hibbeler to score from third, giving Texas a 1-0 lead. In the third, Ryan Reynolds committed his eighth error of the season on a wild throw to second. That put two runners aboard and by the end of the frame, the Hoosiers plated two unearned runs. Texas trailed for the first time this whole regional, 2-1 after three innings. Texas got on the board again in the sixth when Zach Zubia sent one over the wall in left centerfield. The Longhorns tied it up, 2-2. Then in the seventh, Kody Clemens, the All-American and Big 12 player of the year, came through for his team yet again. Not by way of the longball, but this time with a double, driving in David Hamilton from first base. That gave the Texas back the lead, 3-2. Starting pitcher Blair Henley left the game in the eighth inning to a standing ovation and a Texas crowd chanting his name. Henley pitched seven and a third innings, giving up zero runs on six hits with eight strikeouts. Indiana threatened in the bottom of the ninth with runners at first and second and no outs. After Andy McGuire retired one batter, he issued a walk to load the bases. That's when Texas Head Coach David Pierce called for Chase Shugart out of the bullpen. A strikeout later, the game nearly ended when Masen Hibbeler made a great catch over the fence in foul territory. However, the catch was waived as he did not have clear possession. No harm, no foul though as Shugart got the final out with a swinging strikeout. Texas won 3-2 to advance to it’s tenth super regional. Next up, it looks like the Longhorns will go to Oxford to face Ole Miss. That won’t be confirmed until Monday.